J Clin Invest. 2007;117(2):284–284. https://doi.org/10.1172/JCI31209. John Brockman. Vintage. New York, New York, USA. 2006. $14.00ISBN: 0-307-27722-4 (paperback).272 pp. The question of what to teach our nation’s children about how life on our planet emerged has become one of the most contentious issues in American public education. This topic was debated in our country once before, when in 1925 the state of Tennessee charged John Scopes, a public school teacher, with breaking the law by teaching evolution. For many of us who remember studying Inherit the wind, a play that popularized this trial, it is perplexing that the question of how to teach the beginning of human life is again controversial. Much of the scientific community is watching this debate with angst, as emotion appears to be replacing reason, leading to potential fundamental changes in public school science curricula. Of greater concern, the resolution of the debate between proponents of teaching intelligent design (the notion that the complexity of living creatures could have arisen only from the deliberate act of an intelligent force) and those who feel that only evolution should be taught in schools (as it is now) runs the risk of derailing our entire notion of how science should intersect with society, an issue with tremendous potential for negative consequences on a broader scale. Blurring the distinction between scientific method, i.e., formulating then rigorously testing hypotheses, and drawing ideas from religious convictions will make it even harder to study and intervene in other critical areas where science must take the lead, for example, the effects of climate change or diminishing biodiversity. 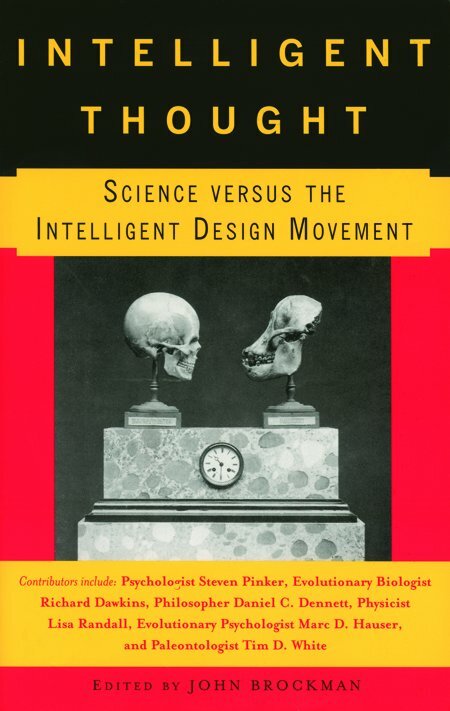 In Intelligent thought: science versus the intelligent design movement, John Brockman presents 16 essays by scholars in various disciplines who present their own perspectives on how to respond to proponents of intelligent design and, in some cases, on why this issue has arisen. The essays are written for a scientifically sophisticated audience, and although authored by scholars in very disparate fields, each is accessible to readers knowledgeable about the tenets of basic biology. Overall, the essays are written well and complement each other in arguing that the intelligent design movement presents an acute risk to science education. More important is the message that underscores many of the essays: that this debate is emblematic of how our society understands (or misunderstands) the scientific method and that the potential ramifications of this misunderstanding as we face issues ranging from stem cell research to the problem of global warming are great. Most of the essays summarize compelling findings that debunk important tenets of intelligent design. Many of them also contrast intelligent design with the theory of evolution by discussing the essential distinction between a legitimate scientific theory that invites experimentation to test its validity versus statements of faith that cannot be rigorously examined. Nearly all the authors conclude that evolution is an example of the first and that intelligent design epitomizes the second. Therefore, intelligent design should not be taught as part of the science curriculum; it is not, in fact, science. Interestingly, the essay by Stuart Kauffman, director of the Institute for Biocomplexity and Informatics at the University of Calgary, takes a slightly different turn. Kauffman argues that there are testable questions inherent in the notion of intelligent design and that a rigorous examination of these questions must lead one to reject the basic construct of the intelligent design movement, making it inappropriate for this concept to be taught in a science curriculum. It is noteworthy that Brockman has chosen not to include in his text any material from proponents of intelligent design. At first, the reader might be taken aback by this omission given that the popular press and media feel it is their responsibility to always provide equal time to opposing points of view. I found it refreshing that the compiler of these essays was willing to take a strong stand because, as vividly portrayed by the authors of the essays, this is one notion for which there is no legitimate scientific merit. Intelligent thought ends with an abridged version of the decision of the United States District Court in a suit against the Dover, Pennsylvania, School District brought in response to the school board’s requirement that intelligent design be taught as an alternative to the theory of evolution. In his finding against the school board, Judge John E. Jones III did not base his ruling on the veracity of the notion of intelligent design but rather on his determination that intelligent design is not science and therefore has no place in the science curriculum, a decision that resonates with each of the essays in Intelligent thought. Unfortunately, neither Judge Jones’s decision nor Intelligent thoughtwill be read by large segments of the population, and in fact, the book is most likely to be read by those who already agree with its conclusions. This text does, however, provide a series of thoughtful essays that will prove valuable to those who wish to understand more fully the underpinnings of this debate, the resolution of which will have important implications for our society.